One of the most interesting comic book movies coming out next year is Suicide Squad. The film is based off a more obscure DC comic book property but has a star-filled cast including Will Smith, Jared Leto, Margot Robbie, Jai Courtney and formerly Tom Hardy. We reported not to long ago that Hardy had left the project, who would have played Rick Flagg, the team's leader (read that article here). Rumors have been going around as to why he left. Some are saying it's because of Hardy's schedule and previous commitments. Others are saying it's because of the script. However, all are rumors as Warner Bros. has not specified to reason for Hardy's departure. Yet, with the news of Hardy leaving, reports were saying that Jake Gyllenhaal was in negotiations to replace him. Now, it looks as if that won't happen either. Variety is reporting that Gyllenhaal has passed on Suicide Squad as well, reportedly because of the script. I love Gyllenhaal. He's a fantastic actor and I think he would have been great in a comic book film. Whatever the reason is that Gyllenhaal is passing, I'm sad to see him go. Now the question comes to who they'll get to play Rick Flagg. It seems that they are going to class-act talent, so I'm expecting that pretty soon we'll be hearing about some pretty big-name actors in consideration for the role. What do you think? Are you sad that Jake Gyllenhaal has passed on Suicide Squad? Are you looking forward to the film? 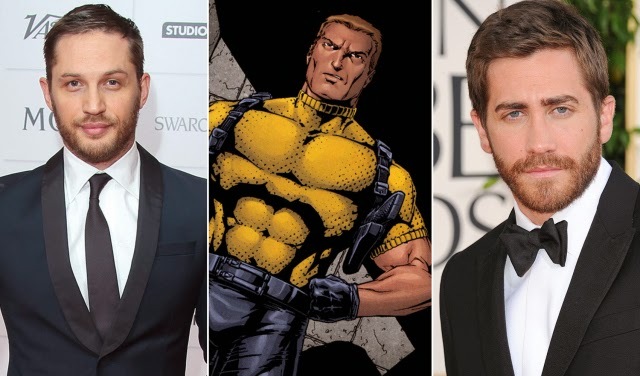 Who do you think they should get to play Rick Flagg? Leave your thoughts in the comments section below. Could J.K. Simmons Return to Spider-Man? The Movie Paradise Has Reached 2,000 Page Views! World War Z Sequel Update; Getting a Clean Slate? Jurassic World- Hybrid Dinosaur Revealed? Kong: Skull Island Set in the 1970s? Tom Hardy Leaves Suicide Squad? Could a Gone Girl Sequel Happen?